Smart Growth America and the National Complete Streets Coalition released their Dangerous by Design 2014 [PDF] report today, showing that California has the nation’s second-highest pedestrian fatality rate for older pedestrians (age 65 and older). The report highlights the ways car-centric design in US cities makes streets dangerous for walking, and ranks major metropolitan areas using the Pedestrian Danger Index (PDI), the ratio of annual fatality rates to the percentage of people who walk to work. California was ranked 17th on the PDI, with pedestrians deaths making up 19 percent of the state’s total traffic fatalities. California’s elderly pedestrian fatality rate, at 5.03 fatalities per 100,000 people (compared to 3.19 nationally), is second only to Hawaii, followed by New York. Nationwide, older adults account for 21 percent of pedestrian fatalities, while only making up 12.6 percent of the population. The per-capita fatality rate doesn’t take walking rates into account, as the PDI does, so it doesn’t necessarily mean California is the second most dangerous state for elderly pedestrians. As the report notes, “As tourist destinations, the fatality rates” in the top states “may be somewhat skewed.” Florida, known for its tourist industry and high population of retirees, had the fifth-highest senior pedestrian fatality rate, after Washington, D.C. In the greater Los Angeles area, 28.2 percent of the traffic deaths between 2003 and 2012 were pedestrians. In the San Francisco Bay area the percentage was 26.8, but the region was also ranked the 47th most dangerous region out of 51, which seems to demonstrate the effect higher walking rates have on per capita fatality rates. Since the PDI is based on the number of pedestrian fatalities per population that walks to work, it doesn’t include anyone walking for any other reason, leaving out a large number of walking trips, which can inflate or deflate the fatality rate. The difficulty in comparing pedestrian safety stats “just underscores the fact that we need better data collection,” said Tony Dang of California Walks. Older adults face more risks as pedestrians because they may be less able to react quickly to an oncoming vehicle. Once struck, their increased frailty makes them less likely to recover from a serious collision. Further, older adults may have greater exposure to pedestrian crashes as they increasingly give up their car keys and seek alternative ways to get around. An AARP Public Policy Institute analysis of the 2009 National Household Travel Survey (the most recent available) found that between 2001 and 2009, the share of trips older adults made by transit increased by 40 percent. As most transit trips involve some amount of walking, we would expect that walking trips also have increased considerably among the older population. Dangerous by Design includes solutions for safer street designs that states are taking to start saving lives. In the 2011 report, Florida had four of the most dangerous metropolitan areas for pedestrians in the nation, and the state reacted by initiating a concerted effort to improve conditions. Among them was a statewide Pedestrian and Bicycle Strategic Safety Plan. But Florida, and other states, still have a lot of work to do. 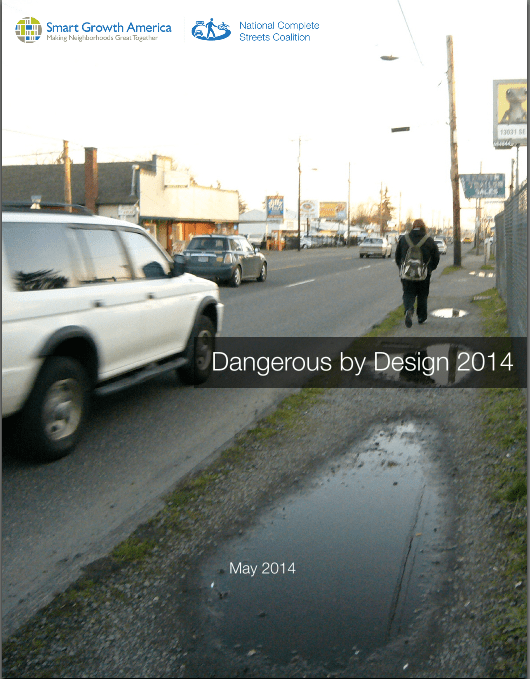 As Dangerous by Design‘s authors remind us, “Zero is the only acceptable number” when it comes to traffic fatalities.